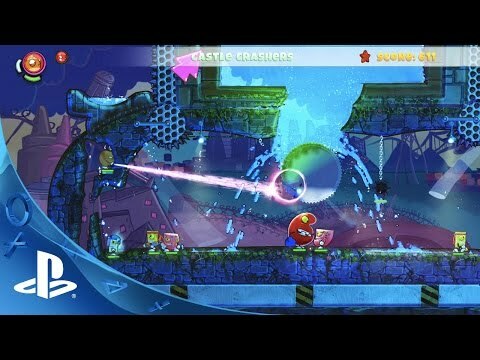 Organic Panic is an action puzzle platformer with totally destructible environments and dynamic fluids. Smash through earth, create and turn into water, control gravity, and set it all on fire as you battle and puzzle your way through over 200 Single Player, Coop, and Versus levels. 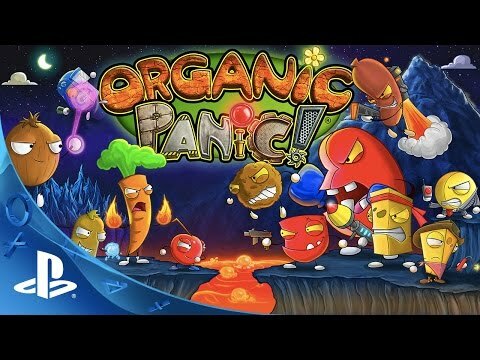 Organic Panic is a super-kooky, action-puzzle platformer with totally destructible environments and dynamic, interactive fluids! The mind-bending, physics-based 'DAFT Engine' (Destructible and Fluid Technology) creates unique and diverse gameplay possibilities: wood floats and burns, lightning conducts, ice slips and melts, water douses fire, rubber bounces, acid disintegrates and more! Swap between and master 4 elemental-powered heroes (Cherie, Kiwi, Carrot and Coconut) to devour Baby Cheese's evil technological empire. Smash through earth, create and turn into water, control gravity and set the world on fire as you battle through over 200 fast-paced Single-Player, Co-op and Versus levels! Many hours of mind bending gameplay. Use brain and brawn to overcome unique physic’s based puzzles, break through the ground, pour lava onto enemies, put out fires with water, the combinations are endless and require lateral thinking to solve. Puzzles are not linear! Solve levels in many different ways, find new, better ways to complete levels. These modes give more diversity, play with 2 characters at the same time, or as morph-able switches, play against the clock or choose the characters to complete a level. Comic driven story, Help Apple save his sister, and the world from the evil Baby Cheese and his technological empire. Learn each characters special abilities and magic powers. Grab your friends and work together, mind meld and solve more challenging puzzles combining abilities. When you're ready there's Versus! With intense eye melting action, new Mega Powers (which can be combined!) and a variety of Versus game modes, losing friends has never felt this good! Run a marathon? You can earn a Trophy for that! Show how good you really are, with variable gameplay the score cards are going to be a good way to see who's really got gold! The downloadable version of the game supports English, French, Italian, German, Spanish, and Portuguese. Help Apple save his sister Eva, who's pure magic energy is being harvested by the maniacal evil Baby Cheese to feed his technological empire. Every Fruit and Veggie has their own special magic gifts. Help Apple train his rebel acolytes, and learn their unique gifts, Fiery Carrot, Ground breaking Cherry, Gravity deifying Coconut and Aqua force Kiwi are ready, but they need help learning their new magic powers. Beware before them lies treacherous territory and even more treacherous Meats and Cheese, each with it's own brand of weaponized destruction. Organic Panic is trademark registered in the US Patent and Trademark Office. ©2016 Last Limb LLC. All rights reserved.